On Second Scoop: Ice Cream Reviews: Bears like ice cream? 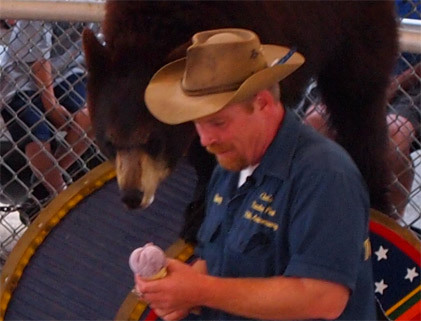 Did you know bears eat ice cream? In particular North American Black Bears eating Gifford's Black Raspberry ice cream, but more on that later since that was at the end of our trip, not the beginning. You see, we decided to head north last minute, in general because we badly needed a vacation but specifically because my daughter had no place to go as most summer camps hadn't started up yet. We've been meaning to do a big loop through the White Mountains again so off we went into the wild blue-ish sometimes grey yonder. Since this is me we are talking about, I overplanned a bit, but I think it went better than last time. Now it's a four hour drive to get to Conway, New Hampshire. Hampton Beach happens to be right around the two hour mark, so why not hit the beach on the way there. So we did. All things considered, it went surprisingly well. Digging in the sand with my kids takes me way back to my own childhood. The problem is my daughter wants to go in the water while my son wants to smush sand castles. The sand is fun but fairly large sized particules. The water is cool and refreshing but chock full of seaweed.... Choices choices choices and only about 90 minutes of play time before we turn into BBQ'd New Englanders (mental note: buy beach umbrella). We would have loved some ice cream on the way out of this traffic disaster of a tourist spot, but decided heading for the highway was the safest thing to do --- oh, side note: I've only been here once or twice as before, but nothing feels familiar about this place at all. How weird. We continue not too much farther before realizing we are starved. We stop at a mall for a quick stretch and decide that Buffalo Wild Wings is a much better choice than McDonald's for an early dinner. Surprisingly it was quiet and they did a fine job of handling my sons allergies. As for me, well mine wasn't the greatest sandwich that ever lived, but I thoroughly enjoyed my BBQ Burger (that actually tasted like BBQ). "Where do May Flies go in June?" "New Hampshire"
Day 2 started off with one of the worst breakfast buffets I've ever seen. My kids wound up eating cereal and my wife and I tried to engage in some unamusing and greasy foods. Yuck. The kids may have eaten free, but after you factor in our tickets, this meal was not worth $28. Day 2 was all about Story Land, where fairy tale stories attempt to come to life. 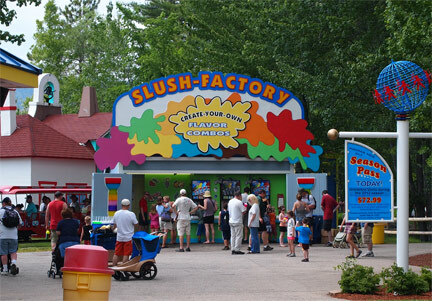 It's aimed for the younger kids with a mini train, boat rides, and a bunch of kiddie rides. Oh, and a decent small roller coaster and flume. You get the idea. 4-5-6 is probably the best ages for this place. I was going to take shots of all the places that had frozen treats in the park, but the heat and humidity were oppressive and kind of knocked the appetite out of me (I know, shocking!). We did stop at this neat little rainbow ICEE place. You get these totally foolish cups that you can fill with up to 9 flavors of ICEE. That's right, nine flavors. My daughter had fun making a big mix and my son picked just blue raspberry and cherry... he then took one big sip and was done, kind of like I expected. They also had a hawaiin shave ice place which seemed somewhat popular, and there were several places to snag softserve. There was even some funky dole fruity softserve which I should have tried since I've never seen it before. Now I love the thought of trying new food at a new restaurant, but my shyness at unfamiliar places combined with my son's food allergies make this a moot point for the most part. 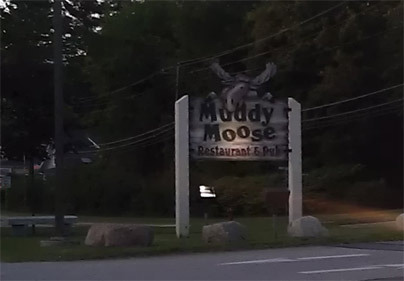 That said, I couldn't help but stop at a place called the Muddy Moose. The parking lot was packed and kids where coming and going, so it has to be safe right? We went in and they did a nice job accommodating us. Overall we had a nice meal. In fact, my daughter's grilled cheese was so tasty, that we ordered a few more for dinner to go on Day 3. Day 3 started off at another fun sounding place "The Blueberry Muffin". I was wondering why each pancake was $3.50... and then I realized it's because each one is the size of a dinner plate. The meal was decent, but I had hoped for fresh blueberries in my pancake, not a can of blueberries. Oh well, off to roam North Conway. Now we had debated taking a trip on the Conway Scenic Railroad, but my son wanted none of it (despite his love of trains). So we decided to shop the main street a bit. There's a old general store and a toy store and all kinds of neat little shops that you can burn up a day with. There's even a Ben & Jerry's there, though I was more interested in hitting up the White Mountain Cupcakery (but I decided to do the "smart" thing and hold off on cupcakes and have lunch instead). 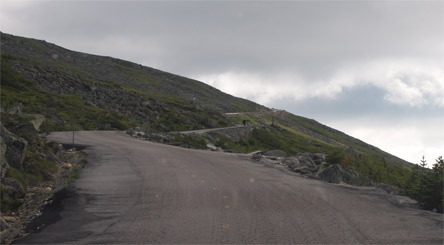 After lunch, we did the drive of all (New England) drives... we headed for the Mount Washington Auto Road. 8 slow miles of "oh my word we're gonna off the edge!" driving excitement. I'm approaching the half million miles driven mark, and despite me teasing my wife the whole way up, I will admit I was a bit.... unsettled shall we say. HAHAHAHAHA, ice cream!! That's right, the observatory on the top of the mountain has drinks, treats, and ice cream! Oh man, I really want to plopped down with a treat right now.... but I can't do it. I have three choices. Fudge bars (ehh, not in the mood), ice cream pints from a brand I've never heard of, and nut covered drumsticks. What people don't realize about food allergies is just how tough they are to live with. You constantly make tiny decisions all day long about minimizing nut exposure. I can't be eating this stuff with my son next to me. That's not fair to him. So I give up and head back outside. 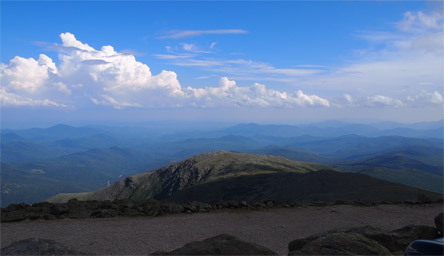 Despite the 59 degree temp, the 35 mph wind, and the fact I'm wearing shorts and no coat, I could stay up here forever. Even though it took me 10-15 minutes to adapt to the thinner air, I still want to stay up here. It's peaceful and I love it. My daughter came with me to walk out to these stone trail markers they have and I kept looking at the path going "if only we could keep going" but we were ill prepared. We head back down the mountain and enjoy the smell of burning brakes all the way down. That's right, D1 ain't slow enough and pumping the brakes only does so much good. We kept taking cooling stops until we made it back down the mountain. At least the view was nice when we stopped. Sure the rain is intermittent, but I am unwilling to ride a metal attraction when there's thunder and lightning about. We wait 45 minutes hoping it will pass but it never does. Oh what to do? We should have stayed in North Conway and gone home the other way... but it's too late. Hmmm, well, there is one more attraction that my buddy always tells me to go see, it's called Clark's Trading Post... and they have bears... and not just any bears. 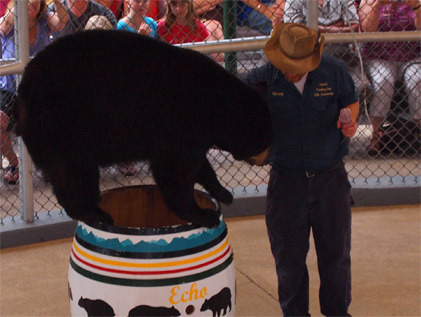 These are very special trained bears that eat a very special treat during the show. I don't want to show too many pictures and ruin the surprise of you stopping by, but there's nothing wrong with making a pit stop here. It's a neat little show and definitely something you won't really see anywhere else. They have some other stuff to fill up your day as well, including a sundae shop which unfortunately we did not get a chance to check out. 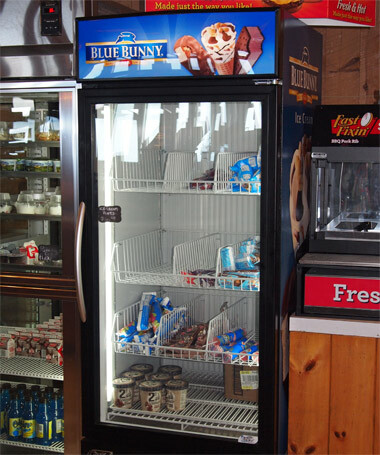 You missed out by not trying that ice cream at the bottom of the blue bunny freezer called 2nd St. Creamery as I've heard great things about it. No worries, that's the "mystery" ice cream I was referring for Saturday's (today's) upcoming review. Hopefully you got to try both the Caramel and Strawberry ones (the Mint one looks interesting too). Looking forward to the review! We actually went to Santa's Village several years ago during the summer when it wasnt too busy. I definitely recommend it as well!